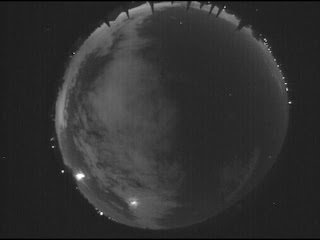 ELPALLSKY is awaiting video from several Sentinel Fireball Network Cameras in the Midwest states. UPDATES WILL BE POSTED AS DATA/IMAGERY ARE MADE AVAILABLE. BOOKMARK THIS SITE FOR UPDATES !!! This event interested my office neighbor at the SETI Institute, says Peter Jenniskens, an expert in meteor showers who also retrieved the fragments of 2008TC3 in Sudan in 2008. He pointed out that the size of the Californian meteor is very similar to 2008TC3, hence fragments should have reached the surface. 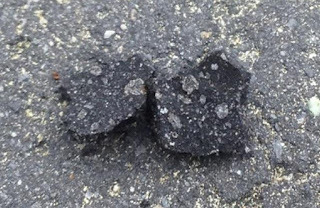 Getting fresh fragments of meteoroids, called meteorites, is key for astronomers to understand the composition of those remnants of the formation of the solar system. Fresh fragments are unaltered by the Earth’s weather and erosion processes, so they are pristine samples which can be used to detect organic materials for instance. 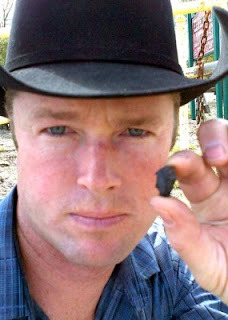 Peter Jenniskens discovers a second specimen of what is officially now called, The Sutter’s Mill meteorite. LIVE VIDEO FROM THE INTERNATIONAL SPACE STATION...NASA COVERING THE LYRID METEOR SHOWER FROM SPACE !! note: if the ISS video is blank, please be patient and wait for re-acquisition of signal as there will be intermittent signal loss. 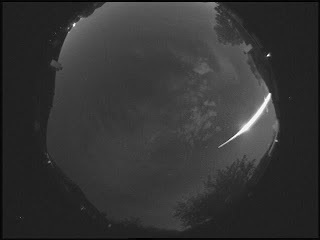 North Texas Meteor Fireball Reported to ELPALLSKY 16APR2011 04:16 A.M. CDT Captured By Sandia Sentinel Fireball Cameras...EYEWITNESSES, PLEASE REPORT!! Daylight Fireball Widely Seen Over Central Texas...Please Email Visual Reports, Pictures, Videos To ELPALLSKY (click) !! 02APR2011-11:50 a.m. CD...This event is reported to have lasted up to ten seconds and varied in color. Meteor is said to have had a nearly vertical downward trajectory. If you witnessed this event, please indicate the time, your location, direction you were facing, direction in which the object traveled (left to right etc. is ok) color, and any flashes which may have accompanied this event. THANK YOU! It must have been big. 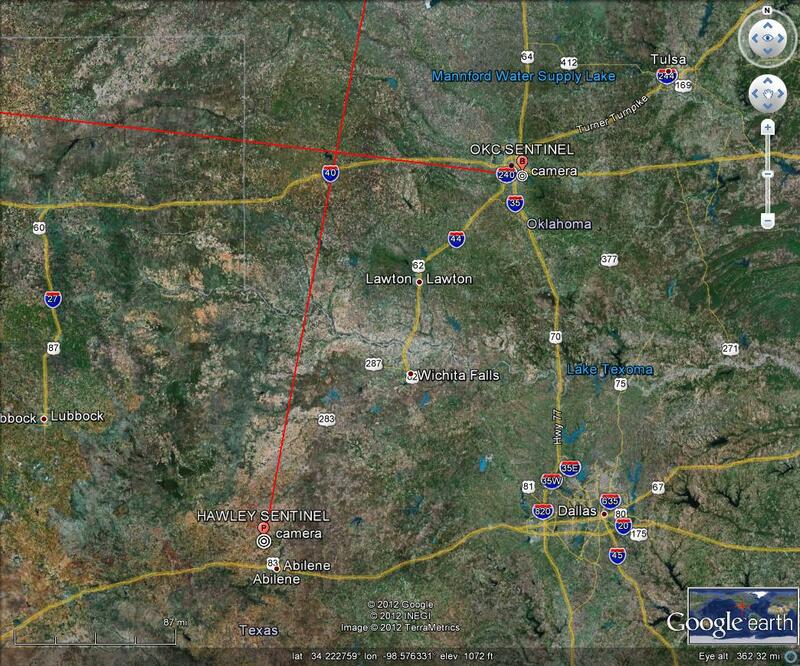 I was 50 miles North of College Station traveling south and saw the part that appeared to drop straight down. People as far sought as San Antonio saw it while facing south as well. 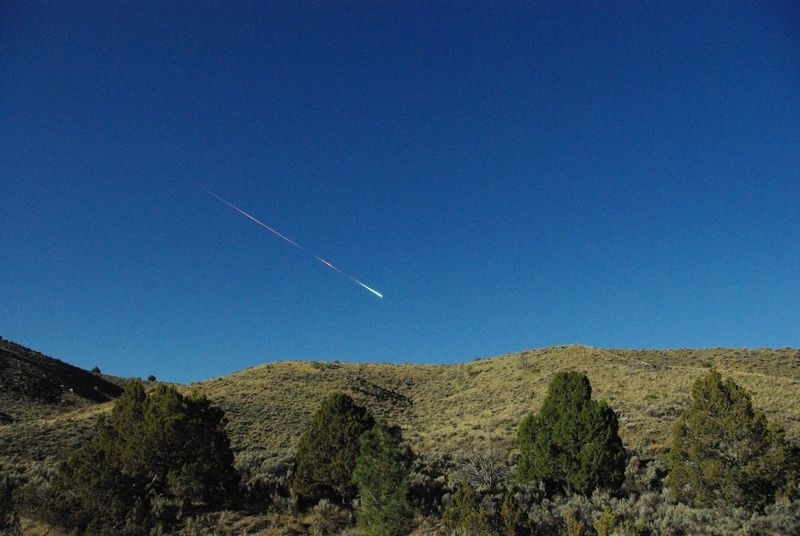 I have never heard of seeing a meteorite during the day. I only saw it for a few seconds before my view was blocked but it was pretty incredible. It was around 11:50 and I was outside of San Marcos off of 21 by the airport. I was working in the field when I saw it fall straight down out of the sky. I was facing in the East direction and it looked like a white light blazing object. While these changes are being installed on ELPALLSKY, no new fireball reports will appear. to file an eyewitness report, or to see other reports and to get updated information on the event. Thank you for your patience and continued support and contributions to elpallsky and meteor science. I was driving eastbound on the Queen Elizabeth Way from Burlington towards Mississauga after work today. I don't know the exact time, but it was around 6p. I saw a green ball of light falling across the sky. At first I thought it was airplane lights, but it was going very fast and downwards as if nose diving. The sky was dark so I did not have a point of reference. Then I thought it was fireworks. It had a tail of light and just vanished. A few seconds after, two OPP vehicles sped past with their sirens blaring. I'm not sure if the two are related. 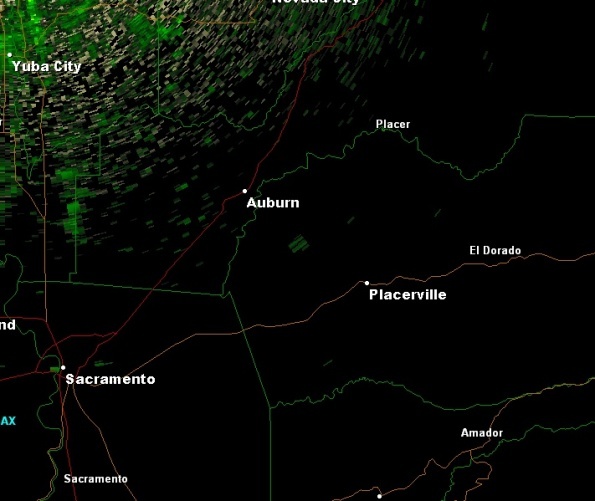 I turned on the radio expecting to hear a news report about it, but did not and have been trying to figure out what it was I saw. There didn't seem to be any explosions and I couldn't tell how far it was. 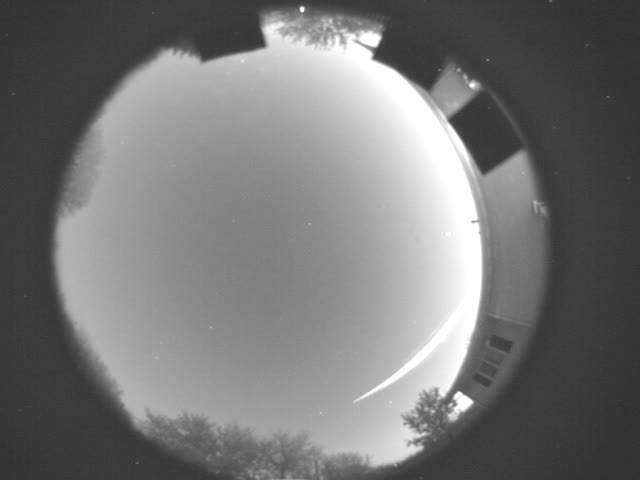 At dusk today, traveling on I-4 eastbound just south of downtown Orlando, spotted fireball in the east. Duration of sighting about three to four seconds. Large with clearly flaming tail, greenish color. Small piece seemed to break off and burn out before large mass burned up and disappeared from view. 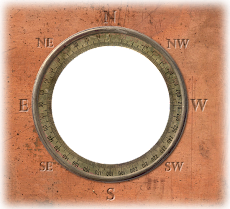 Direction was roughly south to north. No other reports on local news yet. Event witnessed by both my wife and me. 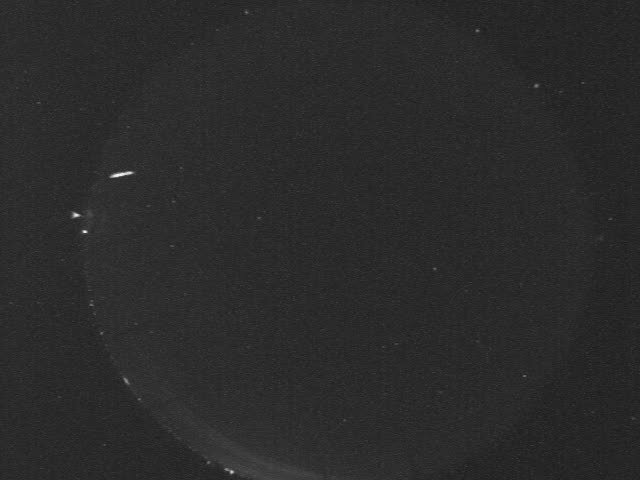 Astronomers from the University of Western Ontario have captured on video, a relatively rare occurrence — a meteor, estimated to be 4.5 billion years old, as it falls from the evening sky just outside of Toronto.The bright fireball or meteor travelled through the evening sky east of Toronto on Monday and was captured by a highly advanced video surveillance system from the university. 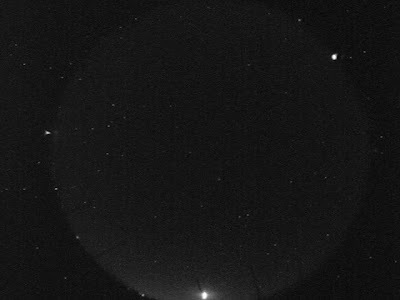 Six cameras from Western’s Southern Ontario Meteor Network recorded a slow-moving fireball, estimated to be no bigger than a basketball, at 6:04 p.m. It first entered the atmosphere at a shallow angle of 25 degrees at 14 kilometres per second. The sighting occurred near the peak of the annual Geminid meteor shower, but the meteor is unrelated to that shower. The meteor, which was the size of a basketball, originates from the asteroid belt between Mars and Jupiter and is roughly the age of the solar system and older than any rocks on earth, said Peter Brown, director of Western’s Centre for Planetary and Space Exploration, in an interview with the Star. 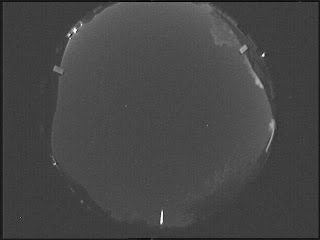 Astronomers use the term meteor to describe the fireball as it passes through the atmosphere; prior to entry as it travels in space, it is called a meteoroid and when it lands on Earth it is called a meteorite, Brown said. And Brown’s surveillance cameras, radar and sound technology were there to record it all in its glory. And now the six different views of the meteor’s descent are on YouTube for the world to watch. 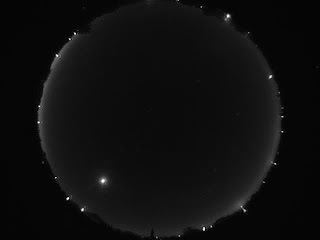 When Brown, a professor in the physics and astronomy department at University of Western, received an automated notification from the network that it had recorded the descent of the meteor, he was excited and hopeful that it might have made its way to Earth. More often than not, meteors burn up in the atmosphere. It took a day or two, but after calculating its altitude and rate of descent, he was convinced that it likely landed somewhere near the town of Selwyn, Ont., about 160 kilometres northeast of Toronto. The meteor first became visible over Lake Erie then moved toward the north-northeast ending just south of Selwyn, he explained. 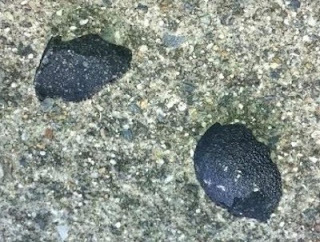 Then, as the meteor descended, it likely broke into pieces and dropped several small meteorites — ranging from the size of a softball to grains of sand — along its path. “Finding a meteorite from a fireball captured by video is equivalent to a planetary sample return mission,” said Brown. “We know where the object comes from in our solar system and can study it in the lab. Only about a dozen previous meteorite falls have had their orbits measured by cameras so each new event adds significantly to our understanding of the small bodies in the solar system. “It’s equivalent to sending a spacecraft out to an asteroid, grabbing some material and bringing it back for study,” he said. Each new meteorite studied adds to scientists’ understanding of the formation and evolution of the solar system, Brown said. 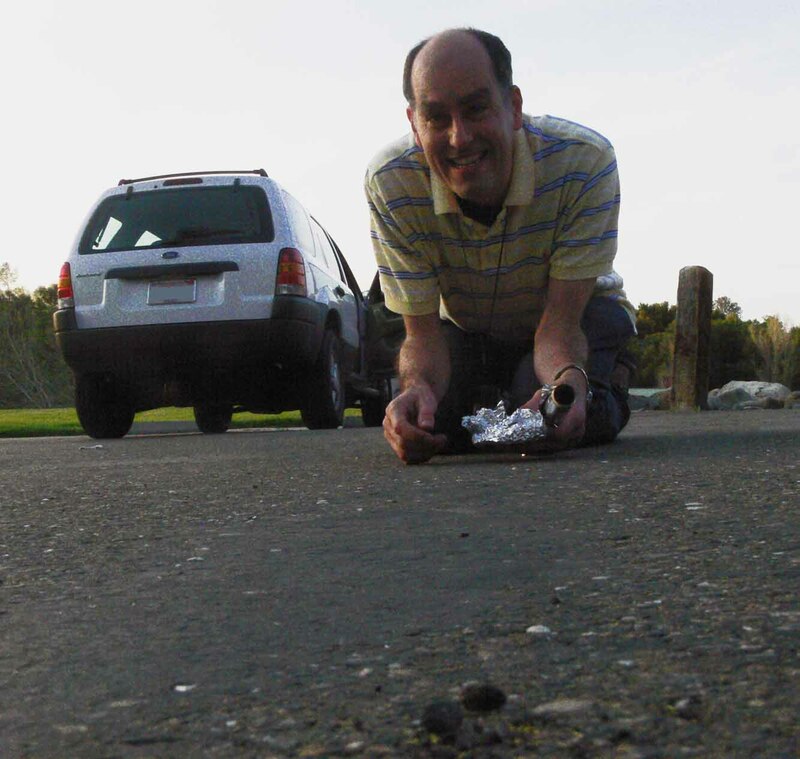 And it’s hoped that once rocks from the meteorite are found, Brown and his team can begin studying them. They will look at everything from its mineral make up to its weight, mass and even check for radioactive isotopes. All these things pieces of information are like pieces in a jigsaw puzzle, helping astronomers build a picture of the geology of the solar system, Brown said. 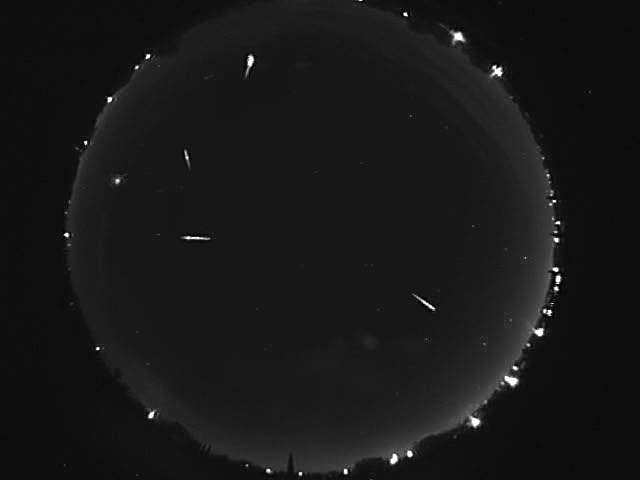 Researchers from Western and the Royal Ontario Museum want to hear from you if you witnessed the meteor falling to Earth, recorded the event yourself or have found fragments of the fallen meteorite and are asking people to contact Kimberly Tait at ktait@rom.on.ca. 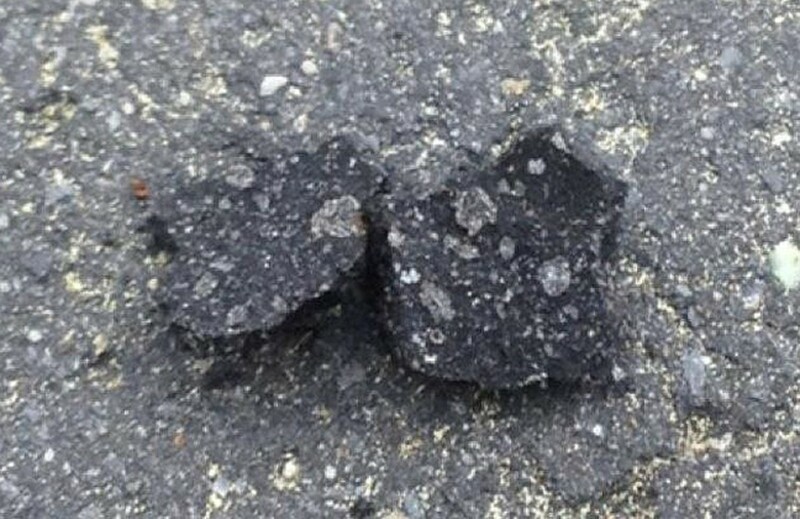 Brown also asks if you live in any of the small towns or communities near the fall zone — such as Clarina, Gilchrist Bay, Woodview and Stony Ridge, all around upper Stony Lake — that you be on the lookout for meteorites. And if you find any, contact the ROM. I was heading West on Nelson Road in Port Orchard, and all of the sudden, above the trees, looked like a shooting star......but bright white with a streak of orange/red through the center, came from the South (left) of my car, and flew over the trees towards the North...(my right) It was so close that I literally slammed on my breaks an ducked, like a low flying aircraft... there was no sound I could hear. I rushed home to check the internet, if anyone else had seen what I saw. QUITE A SITE TO SEE!!! The call I made just after seeing it was 11:56pm Friday,12/16/2011 coming from the South heading North in Port Orchard WA, from Nelson Road. 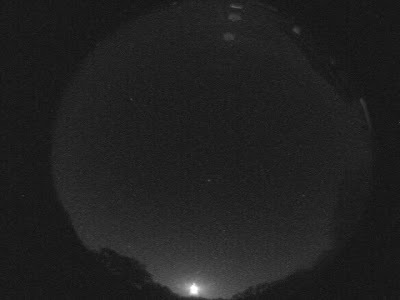 Fireball seen Dec 16, 2012 at Fernandina Beach FL app 8:00 PM (did not look at time could be off) In SE sky moving W to E visible 5 sec bright and flaming. Saw one in NE GA in mid Oct this year. Seen three in my 60+years, two in three months. First in the seventies at Charlotte NC. Thank you Ken for this great shot. Congrats! 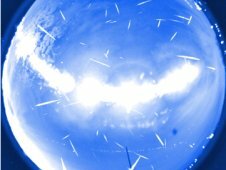 › Wikipedia: Geminids Put on the hot chocolate...find a warm, toasty location...and join us on the night of Dec. 13-14 for our "Up All Night with NASA" live Web chat about the 2011 Geminid meteor shower! The Geminids -- the final major meteor shower of the year -- will be somewhat obstructed by a waning gibbous moon. Anytime between Dec. 12-16 is a valid window for Geminid-watching, but the night of Dec. 13-14 is the anticipated peak. On Tuesday, Dec. 13, meteor experts Dr. Bill Cooke, Danielle Moser and Rhiannon Blaauw from NASA's Marshall Space Flight Center will be answering your questions about the Geminids via a live Web chat. Join them on Dec. 13 at 11 p.m. EST, then stay up until 5 a.m. EST for the meteor shower. Joining the chat is easy. Simply return to this page a few minutes before 11 p.m. EST on Tuesday, Dec. 13. The chat module will appear at the bottom of this page. After you log in, wait for the chat module to be activated, then ask your questions. A live video/audio feed -- did you know that meteors blip, ping, and whistle? -- of the Geminid shower is embedded below. The camera is mounted at NASA's Marshall Space Flight Center in Huntsville, Ala. During the day, you'll see a dark gray box -- the camera is light-activated and will turn on at dusk each evening. Even before the camera activates, you can still hear the audio of meteors passing through the sky. Geminids are pieces of debris from an object called 3200 Phaethon, which is something of a mystery. Near closest approach to the Sun (perihelion), Phaethon exhibits increases in brightness similar to that of a comet; however, its orbit is characteristic of an asteroid. Extinct comet or asteroid? The debate still rages among astronomers. In mid-December of each year, Earth runs into the stream of debris from Phaethon, which causes the Geminid meteor shower -- a beautiful display of meteors for us to enjoy. Unlike the Perseids or Leonids, the Geminids are a relatively young meteor shower, with the first reports occuring in the 1830's citing rates of about 20 per hour. Over the decades the rates have increased -- it is now the best annual meteor shower - and we regularly see between 80 and 120 per hour at its peak on a clear evening. The Moon will hamper that this year, but if your skies are clear you can still expect to see as many as 40 per hour. One can tell if a meteor belongs to a particular shower by tracing back its path to see if it originates near a specific point in the sky, called the radiant. The constellation in which the radiant is located gives the shower its name; Geminids all appear to come from a point in Gemini, Leonids appear to radiant from Leo, and so on. Although at a distance on the horizon from the camera, Sandia Sentinel Fireball Camera Operator Steve Witt posts this capture of the widely seen Eastern US fireball which occured at 04:31 UTC (10:31 pm CST-11:31 pm EST) on Dec 8, 2011. Eyewitness reports to ELPALLSKY follow Steve's video below. Thank you Steve, for your diligence! I saw the same thing...it was a bright green ball with a green tail. I was traveling southeast in montello Wisconsin and the light traveled from left to right. A bright green burning meteor seen all over southern Illinois. Tons of people seen it falling in a bright green light then it exploded. 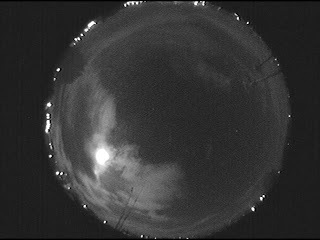 around midnight 08dec11 over Chicago in southern sky a bright white fireball like a low plane came almost straight down from east to west lasting several seconds and breaking into 3 large white chunks with tails. Great website! My name is Pete and I was comming home from Wisconsin on 12-08-2011. I was traveling Southbound on I-294 when around 8PM, I caught glimpse of a huge fireball! I was on the Des Plaines, Illinois area of tollway when at the Eastern part of the sky, there was a bluish-green fireball that had a long tail that seemed to be breaking up. It was traveling about -20* from horizontal and was twice as bright as Jupiter!! I thought for sure I would see this on the news via landing in someone's backyard!